Up to 21% of emails never make it to the intended recipients’ inboxes. If up to 21% of snail mail never made it to your mailbox, heads would roll. Instead of firing people, though, we tend to just shrug our shoulders and say that we need to do a better job of getting around spam filters. Here’s the problem, though. Traditional spam isn’t your downfall. You’re savvy enough to run a clean list. For most email marketers, the problem is graymail. Graymail refers to email that people have opted to receive, but they’ve lost interest in over time. As interest wanes, they stop opening up their email, and sometimes they even mark it as spam. Fortunately, you can get past your graymail problem with a customer reengagement campaign. Check out some of my favorite campaigns and use them as inspiration to create your own. 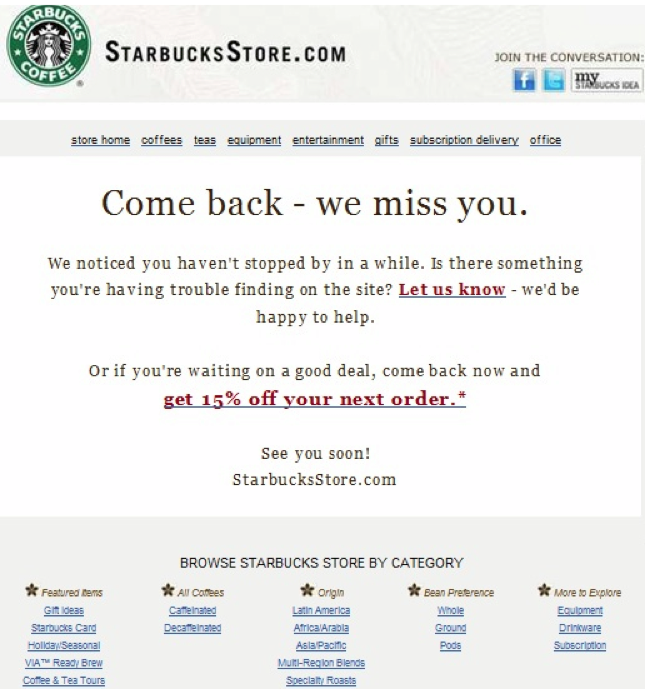 Starbucks put some control back in the customers’ hands with its reengagement campaign. Notice how the company invited people to let the staff know if there are any problems. The opportunity to vent is underrated in the marketing world. Then, of course, Starbucks followed it up with a 15% off coupon. Emails tend to get a much better reception when there’s a coupon inside. True Citrus knocked it out of the park with this campaign. Not only did they let subscribers know that they plan to do better, but it included a special offer. 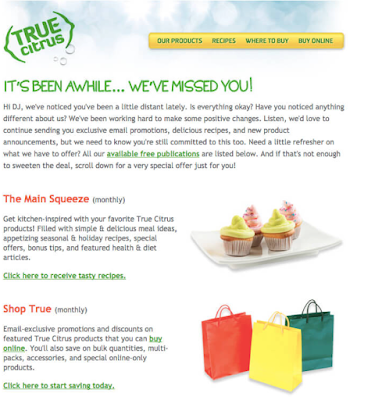 Plus, this is just one of a three-part email campaign provided by True Citrus. If people don’t reply by the third email, they’re knocked off the list. True Citrus doesn’t play games with graymail, but more importantly, they know when to invest and when to back off. It turns out that email can be cool, at least when it’s in the hands of Urban Outfitters’ marketing team. I think this email is by far the most fun on the list. It speaks directly to the texting generation, and it reminds people why they love Urban Outfitters. 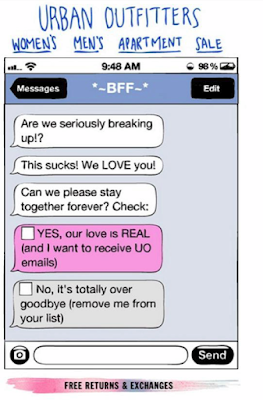 Urban Outfitters’ core demographic might not be tethered to their email accounts, but they are tethered to their phones. 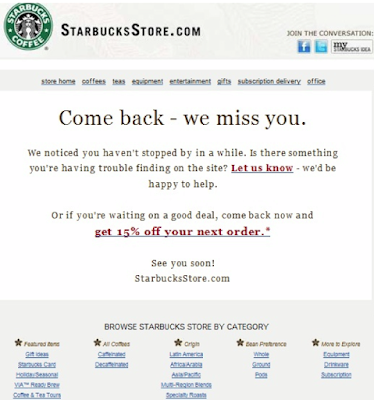 This single email helps the retailer bridge the gap. 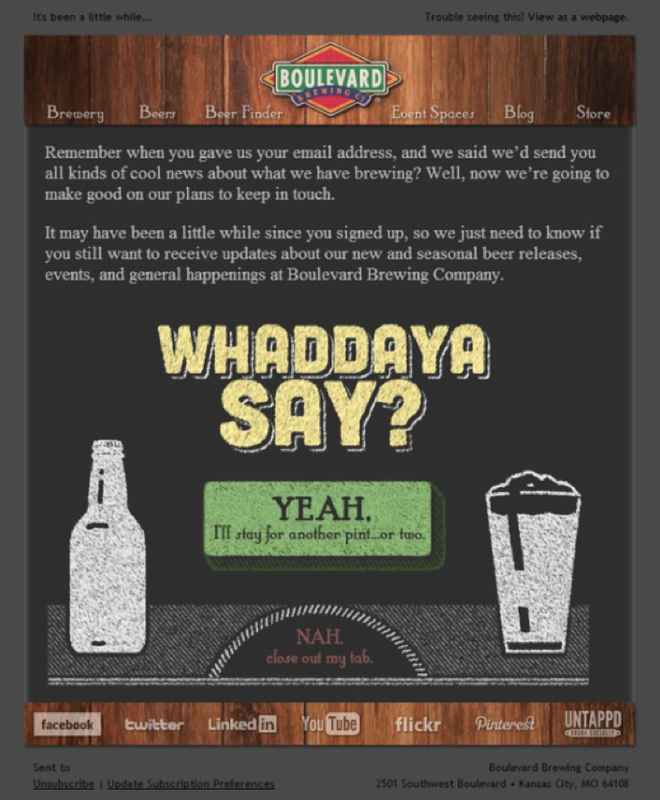 The best marketing campaigns bring customers into the business’s world, and this simple email did just that. Lowe’s has long been a marketing force, so it should come as no surprise that it kills it when it comes to reengagement emails. First, it lets people know that the company has made some improvements. That lets people know that even if they haven’t been opening the emails, things have changed so now it’s time to give them a look. Second, it has social proof. 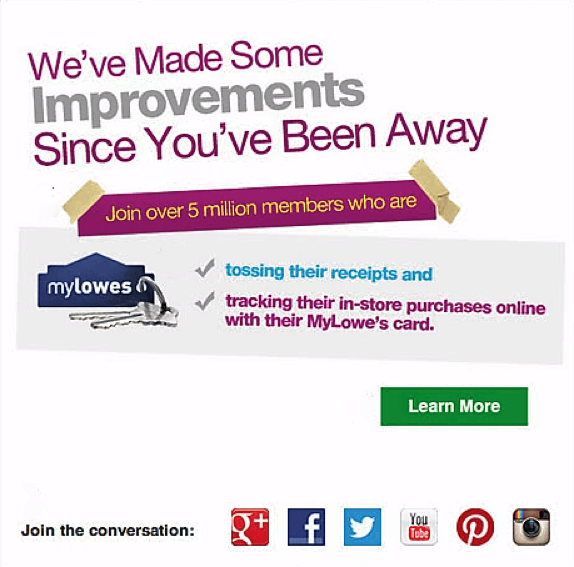 Mentioning the millions of people who are using the MyLowe’s card is a great marketing tactic. This email isn’t just about reengaging subscribers. It’s also about getting them to use the store’s card and make purchases. Well, it turns out, sometimes that’s really true, at least when it comes to email marketing. 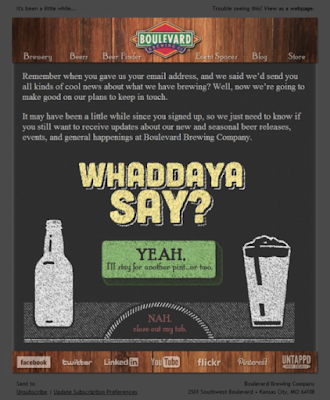 Check out what Boulevard Brewing Company did when they got a little lax with their email marketing campaign. After failing to follow up after collecting email addresses, it sent out a reengagement email to make sure people still wanted to be a part of the list. That allowed the company to prevent the graymail problem before it started. Subscribers had the option to opt out of the list if they weren’t interested. On the other hand, those who were interested were reminded about the list. 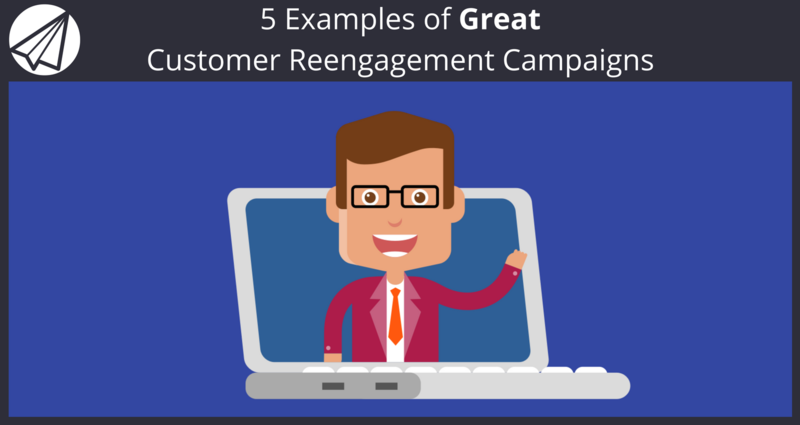 These are just some examples of what you can do with your reengagement campaign. Don’t be afraid to get creative with it. This is the time to test your limits in order to engage your subscribers. You can even use Sendlane™ to create a Workflow so reengagement emails only go out to people who have not responded to previous emails if you wish. I bet you are feeling inspired to start your own email marketing campaigns, so sign up for a free trial of Sendlane™ today. Have I missed any great examples? 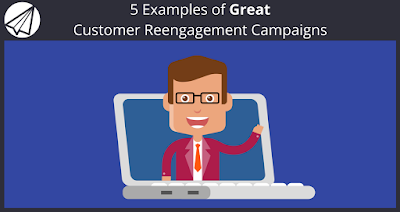 Or have you had good results from customer reengagement campaigns? Let me know in the comments.